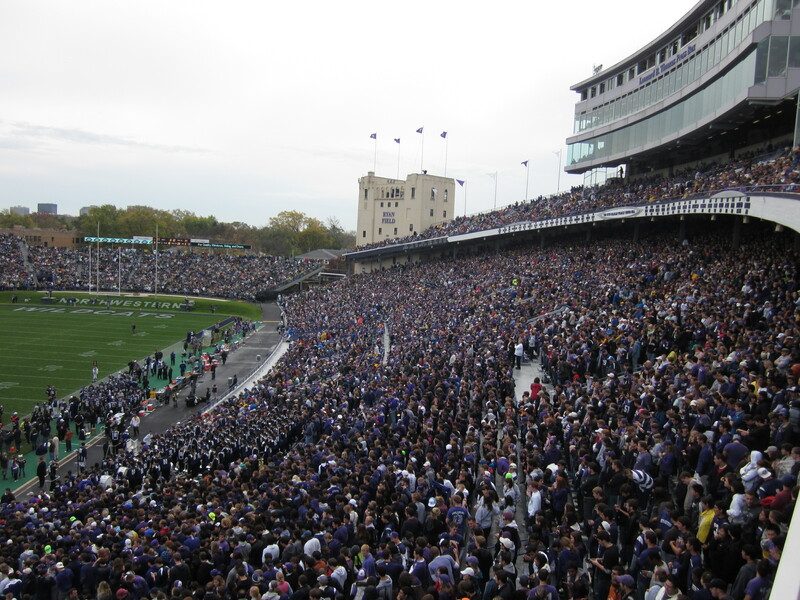 Ryan Field in Evanston, Illinois is known as the “Wrigley Field” of college football. It doesn’t quite have the history of the Cubs, but boasts a very classic and old school stadium atmosphere. For a while now, NU has been calling themselves Chicago’s Big Ten Team. Attempts to market this slogan are popping up around the city, and the evidence is beginning to show with more rumps in the seats in Evanston. Perhaps because Chicagoans are slowly realizing that Northwestern is no longer The Big Ten’s little brother. The glint of the golden Irish helmets have not reflected off the light in Evanston since 1976. Notre Dame and Northwestern have met often in the past, but home games for the Wildcats were typically shifted to Soldier Field. The purple invaded South Bend four years ago and shocked the Irish in overtime. That same magical feeling was hovering over tailgates around Evanston and over Ryan Field as an undefeated Notre Dame team spilled out onto the Wildcats’ home field. Wisconsin has been one of the Big Ten’s best. A worthwhile team to for your hopes to invest. Northwestern awaited pounding their chest. Hoping to topple their Badger guest. Our annual Northwestern tailgate was the highlight for those wearing purple this Saturday. Willie the Wildcat even made a guest appearance. Too bad the Wildcat offense failed to show up today, as well. A seemingly routine Big Ten slugfest turned into a Pandora’s box of points in an overtime thriller. The Wildcats and Spartans were tied at 10-10 at the onset of the fourth quarter. Then, offensive complacency turned into a panic, as though each team suddenly realized how important this late conference contest meant to their overall seasons. All September afternoons need to be this beautiful. Temperatures in the low seventies and sunshine that glistened off Lake Michigan provided the perfect environment for our 7th Annual College Football Tour Northwestern Tailgate. Colleagues and family, old friends and new all joined for food, drink, and games. Tailgating at Northwestern is spread out, but there are some magnificent spots that can rival any Big Ten venue – we found one today. A less than appetizing start for both Northwestern and Iowa had many questioning the relevance of this game. Both squads had suffered losses to FCS division teams and it appeared as though mediocre was the mark to make this year. A cup of coffee and an el train ride separate Chicago’s northside from Evanston, Illinois where the venerable Ryan Field awaits its fans in purple. Fitting that the el train that takes passengers up to Northwestern University is the purple line. Filled with Wildcat fans and a few despondent Purdue fans, the el carried patrons ready for an early kickoff on a unseasonably warm November day.